Review: The Field Guide is the first out of five books in The Spiderwick Chronicles. Written by Holly Black, this book will make you grab the edges of your seat when you read about the unusual creatures and fairies that exist in their world! Jared is one of two sons in the Grace family. As the troublesome one in the family, he is always accused of accidents. Simon is the pet lover of the family and captures the most unusual creatures of our world. Mallory is the oldest of the family and the tough one. She enjoys fencing and is genuine tomboy. The Grace children live with their mother, Helen. They plan to start a new life, living in their Aunt’s abandoned mansion. “The doors were faded gray, worn with age.” The Grace family has moved to their Great Aunt Lucinda’s mansion, which in Jared’s opinion is a bunch of shacks put together. They plan to start a new life in the country after a rough ten years in California. Soon, Jared regrets moving here. Jared begins to hear scraping on the walls of the house. A few days later, he finds that someone had tied his shoes together. That’s when he discovers The Field Guide to Fairies and Magical Beasts. Jared begins to notice more and more signs that prove mythical creatures inhabit the walls of their house. The peculiar thing is, these beasts are invisible, causing no one to believe him. Even stranger events occur the next week. The Field Guide is being stolen by an invisible force, but whom, or should it be what? Packed with mystery, excitement, and twists, The Field Guide takes mystery to a whole new limit! The Field Guide was crammed with realistic scenes such as the Hob Goblin eating the feast of cat, bird and human leg ravenously. I could smell the seasoning on the burnt foot and the peppers on the bird. This book contains mystery, adventure, magical creatures, and makes me want to stay up late to read the final page! I would recommend The Spiderwick Chronicles for anyone who loves mythical creatures and adventure! 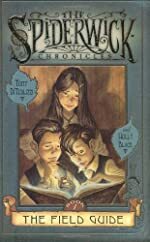 Tony DiTerlizzi has not disappointed me with his illustrations and Holly Black made me want to purchase the whole series! The Field Guide is a New York Times best selling book and so are the rest of the Spiderwick series! Keep up the good work H.B and T.D.! Review written by Chris, Grade 6. Date of review: March 2009.